Victor Mlotshwa, the man who was beaten and placed in a coffin by two men in Middelburg, was also threatened with being shot during the ordeal, the Middelburg Magistrate's Court heard on Thursday. Investigative Officer Detective Constable Dimakatso Bahula testified at Theo Jackson's and Willem Oosthuizen's bail application hearing. He told the court that, on August 17, Mlotshwa left his place of residence at a squatter camp. He had noticed two Land Cruisers following him. Bahula said the bakkies had stopped and two men had got out and assaulted Victor. She also said that both men had warned Mlotshwa that they would shoot him if he tried to run. She said Jackson had allegedly fetched a coffin and told Mlotshwa to get inside, while Oosthuizen allegedly assisted him. They had also threatened him with a knobkerrie. Prosecutor Rean Lourens opposed bail. He said the accused might influence the witnesses and that they might be in danger if they were released. He also said the public peace might be disturbed. 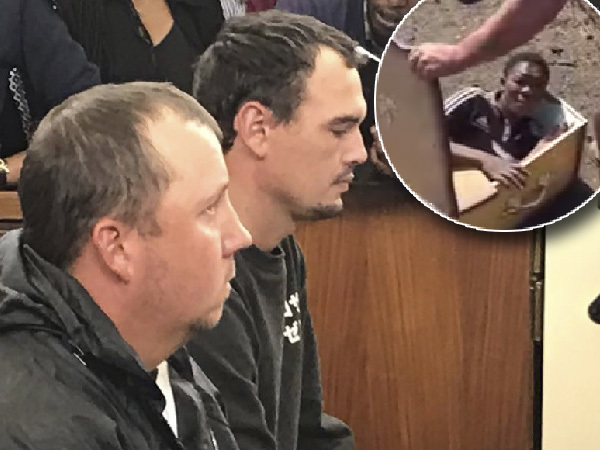 Jackson and Oosthuizen had abandoned their bail bid at their previous appearance last month. They are facing charges of kidnapping and assault, with intent to do grievous bodily harm, Nyuswa said. The case was originally postponed to January 25, while they remained in custody. The incident happened in August. The court gallery was packed with journalists and members of the public on Thursday, while DA and ANC members protested outside. The alleged assault of Mlotshwa took place at the JM de Beer Boerdery, next to the Komati power station in Mpumalanga. In the 20-second video, which was posted on YouTube on November 7, one man, speaking in Afrikaans, forces Mlotshwa into a coffin and threatens to pour petrol on him.